Boys Soccer has qualified for the Playoffs for the 3rd straight season after finishing in 2nd place with a district record of 9-3-2. The first round will be played at Nelson Field this Friday at 7 pm against San Antonio Memorial High School (3rd place, 8-4-2 in district). It is expected to be a close game between two strong teams, and we need your help to create a home field advantage. Please talk to your students about the game and encourage your extracurricular groups to show up, wear Black and Gold, and be loud. Thank you for your support of our program at every level this season. This has been our best year both on the field and in the classroom, and I can tell you that this group is worthy of your support. They are the hardest working, most dedicated team that I have coached, and they play the game the right way. They work hard for each other, they share the ball, and no one cares who scores the goals. Most people do not realize that our teams (boys and girls) play most of our games against schools with clear advantages - booster clubs with deep pockets, turf practice fields, private training, and expensive club soccer team memberships to name a few. Emblematic of the unselfish of that characterizes the team, our most productive player statistically, Luis Lopez, is not the leading scorer. His 6 goals on the season are only tied for 3rd most with Andy Madrid (Josue Montalvan has bagged 9 and Rodrigo Suarez 8). But with 11 assists Luis has been directly involved in over half of the team's 31 goals in district play. The starting goalkeeper Ray Rodriguez has allowed just 16 Goals in District play for a miniscule 1.14 allowed per game playing behind the protection of senior defenders Michael Varela, Chris Torres, Mauricio Ulloa, and Cristian Suarez. Ray has kept 3 clean sheets and made 61 Saves in District for a hugely impressive 79.2% save percentage. This team's 12 overall wins is the highest of my tenure and the win on Senior Night was our 50th overall win in 5 years. The seniors who have played Varsity for 3 years have won 33 games and qualified for playoffs each year. The midfield is anchored by seniors Juan Alvarez and Cubo Hernandez. Juan has had an outstanding season, his first on Varsity, with five goals and two assists. He has been deadly as the team's designated penalty taker in big games. Cubo, who missed the entire 2018 campaign with an ACL injury, returned to the field for his senior year to register one goal, three assists, and three player of the game awards from his position as a holding midfielder. His performance on the field and in the classroom have earned him an offer to play at the next level for Southwestern University. The future is also bright as Sophomore Ricky Hernandez has made a difference in his first Varsity campaign contributing 3 goals and 4 assists. 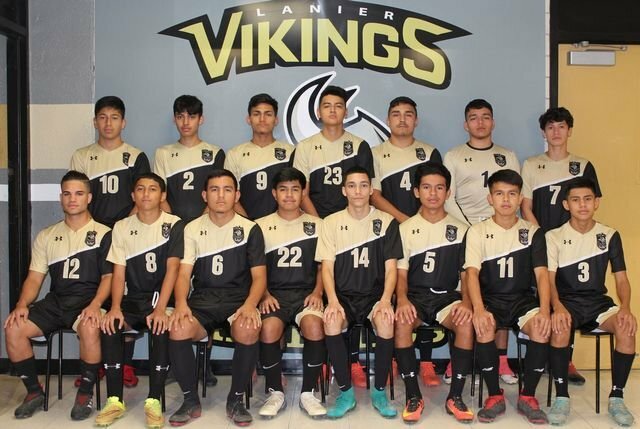 Osbaldo Serna and Diego Stauffer who started the season on Coach Zarate's stellar Freshman squad and Sophomore Hernan Aguilera from Coach Marlin's JV team, have been promoted to Varsity and played important minutes in district competition.